Because he’s considered the patron saint of New York. This is just one of 50 visual references to the life and legends of jolly ole’ Saint Nick that Gustafson has magically designed into his meticulously researched painting. It took him 12 weeks to paint this magical work of art that follows St. Nick’s birth in Turkey around 280 A.D. to the present day. 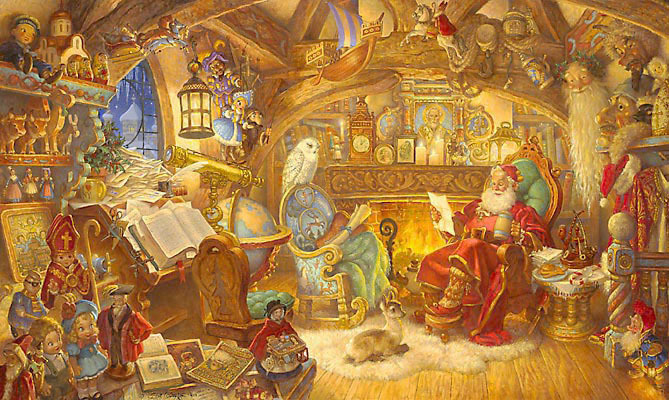 Scott’s painting of St. Nick checking his famous list among the clutter of centuries is worthy of a new tradition. Imagine—it’s time to gather ‘round to decorate the tree. It’s also time to hang St. Nicholas in his Study and share favorite stories about the man in the red suit we’ve come to know as Santa.